As part of its contribution to the Malawi government’s tree planting season, the Malawi University of Science and Technology (MUST) again this year continued with its tradition of working with communities around the university to plant trees. 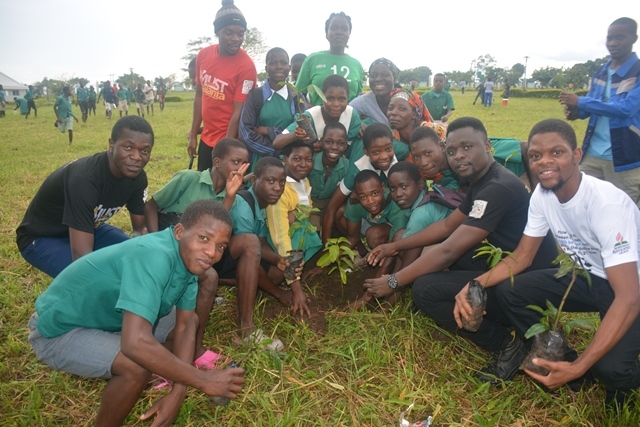 On January 24, 2019 in partnership with Chimvu Primary School pupils, Goliati Milk Bulking Group members, the university’s students and staff planted over 1,000 tree seedlings around its campus in Thyolo. Vice Chancellor Professor Address Malata said trees are important to the university as they add beauty, bring fresh air but more importantly they help in addressing issues o climate change. “As a science and technology university we need to contribute towards efforts of addressing on some of the national problems and climate change is one such important challenge. The involvement of our pioneer students and those from Chimvu Primary School is to instil a sense of responsibility in them. But we also work with community members to foster unity and cooperation,” she said. As for the dairy farmers, they too need to utilise the important role trees play in their sector and we were pleased to see them come with their own tree seedlings to plant on campus. One pupil said she was happy to interact with MUST students as they encouraged her to work harder in class and make it to university. “Although I stay around the university campus, this was my first time to visit the place and it is very beautiful. One day I want to come and learn here. The university authorities also encouraged us to plant trees in our areas,” she said with a smile. One of the dairy farmers, a Mr Mugwa, said trees are important to them as some of them act as animal feed. “There are some trees whose leaves are good animal feed. Trees also maintain moisture and this support growth of grass along river banks which we use as animal feed,” he said, adding that this is the third time they are partnering the university in different areas. Most of the trees the university has planted over the past four years have now grown and the university campus is now looking more beautiful.